Voicemail: We start out with a lot of feedback. Luis comments on Mike S' comments about the Jefferson Bible, and Mike and Summer clarify their views on the philosophy behind Jefferson's intent (and it ain't censorship); Indiana Jim rails about a long copyright voicemails, and give kudos; Mark from VA weighs in on e-book readers and why he wouldn't want or need a separate device; and Zack makes it 3 listener requests that we chat with a copyright lawyer on the show to clear up the issue. 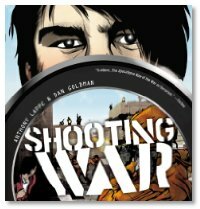 Anthony tells us how the story that grew out of his experiences as a journalist in Iraq changed from being a novel to a graphic novel, and how he partnered with Dan Goldman to bring the story to vivid reality. He tells us how the surreal aura around the reality colored the story of the book, and about letting people figure out how to find out what's going for themselves (and it's not what's coming out of Fox News). Dan shares his approaches to digital art, and creating webcomics and his approach to art, and about working together with everyone involved to get Shooting War into print (lots and lots of ink). Life, art and politics converge frequently, and in this instance, the results are stylish, compelling, and thought-provoking. Start a "Debunking Religion" podcast if you need to spout off, Mike S., but I enjoy your comments a lot more when you stay on topic. You have a lot of very good and interesting things to say... about writing. I don't think we were discussing religion this time... just clarifying a point about Thomas Jefferson's book for a listener who had a question about it. And what to do when religion or faith happen to be a major component of a genre book we're talking about? That seems to be a theme in a lot of fantasy novels, and in books far newer that C. S. Lewis' works. Jennifer Fallon's Second Sons trilogy, Victoria Strauss' The Burning Lands, are recent examples, and very good stories to boot. Writing involves consideration of all aspects of humanity and the human condition... at least, I believe it should, if you want any part of your story to touch the readers. So to me, understanding what does and does not drive people is part of the writing process, and in this world, in this time, we have a very wide range of perspectives on faith, religion and spirituality, as well as a wide range of tolerance as well as a wide range of vehement opposition to any number of perspectives and beliefs from many sides, for and against many other sides. To completely ignore something that means so much to so many people (both in a positive and a negative way) would be a disservice as a story-teller. Do we have to spend an entire show on it? No. But to not answer someone's question about something we talked about earlier would be a little bit rude, especially if it helps others who might have been confused about the same discussion. Summer, thank you for taking the tine to write me such a complete reply. To clarify my earlier comment, I have zero problem with discussions about religion in fiction, or anything that ties into writing. I don't consider religion or politics to be out of bounds for The Dragon Page, and I don't expect you the hosts to hide any opinions you care to reveal on those topics - as long as it ties back to writing in some way. You've listed some excellent examples that would make for some good discussion. My frustration comes from the fact that we're pretty far down the rabbit trail at this point in the recent podcasts, and Mr. Stackpole. going on about his particular theories about the history of Christianity doesn't make for an enjoyable podcast. Honestly, I don't see how the _current_ discussion about religion ties into writing at this point. Having said that, let me say that I've listened to your podcast for over a year now, and it is fantastic 99.9% of the time, but occasionally you guys get caught up in a controversial topic where (ahem) one of your hosts in particular feels the need to argue his particular philosophies ad nauseam, and I feel like I'm listening to a podcast on secular humanism or politics rather than writing. On the other hand, when not on a rabbit trail, that same host (ahem) makes some incredibly insightful comments and it's a joy to listen to him. He's a bright guy. I've already made a note to bring Brandon back on after he's turned in that manuscript to the eager hands at Tor. But hopefully before then, we can track down people with more experience than us on the legal side of the publishing industry to chat about copyrights and content ownership. I'm on the show, and I can't wait to see who MRM brings in! Ah yes, BRANDON Sanderson 🙂 having read two of his books my typo has no excuse. Mistborn: The Final Empire was probably the best novel I read last year - I should do better by him. Austin Grossman and Karen Miller were fantastic interviews, too. You guys get some good ones. I've listened to some of the archaive shows and some of the new ones, and as always you folks do a great job. And I for one did enjoy your talk about the Jefferson bible and its religious/filosophical implications. I also look forward to your "copyright" episode. In talking about the Jefferson bible I find it strange that people get upset by the notion that the "be nice to eachother" message in the bible is good enough to stand on its own without the flashy miracles part. And I do get worried when people try to surpress the fact that the bible is indeed a book! And as such it has been edited and reedited for more that a thousand years to reflect the curent political and theological view of the church. Mindlessly defending todays dogma without knowing its source is not a cleaver thing. Its the trademark of fundamentalism. Great show! I'll be coming back for more. Eric, I am remiss unless I also point out Jennifer Fallon's "Demon Child" Trilogy, comprised of the books Medalon, Treason Keep, and Harshini, as another series with religion as a main cog of the story, and I did some old reviews of her Second Sons trilogy (Lion of Senet, Eye of the Labyrinth, Lord of the Shadows) for a site that doesn't exist anymore, but eventually those will be reposted over at KAMN. We did talk to Jennifer back in Cover to Cover #180, but I just realized that that episode isn't available online anymore. When are you making a slim view of the site for tbe touchy crowd? I agree with the first poster - just stop talking religion and politics. The US is religious, conservative country, and the constant avoidance of offence by the hosts and the angry voicemail that invariably follows is frightfully boring for those of us outside the US, where such things don't matter as much (like here in the UK). Just relax, say what you want, interview who you want, and don't worry about the voicemail you get. You don't need to play all of it. can we please keep the politics to a minimum. I have been listening to podcasts over the last while to avoid having to hear people discussing this stuff 11 months before it really matters. It's not that i disagree, its just that the throbbing pain in my head is back now. This isn't to say i didn't enjoy the interview or the show. It was good as always, just that I can't deal with a two year run up to every election. First, I'd like to thank you for playing my voicemail on the show. That actually took a lot of guts since I thought that if you did you might get angry comments like Paul Darrow's and Eton's comments. Second I'd like to thank Mike Stackpole (as well as Summer and Mike) for trying his best to answer a complicated question. My "anti-Christian/anti-Catholic inference radar" tends to perk up whenever I hear anything said by anyone when related to any of these subjects. There is only so much of this kind of bigotry you can take before you have to stand up and call foul. This is not to say that you guys do it. It's only Mike Stackpole that may sometimes say something annoying and it's usually not really a big deal. I guess I was putting up with to much bias from other sources that week. It's just that everyone seem to and think that it's okay because of the Crusades or the Inquisition (inspite of the fact that Secular humanism had the French revolution, and Atheism had Marxism). Third, I'd like to concur with what Eric Burns wrote on the third comment posted here. He wrote exactly what I was thinking. I love what Mike Stackpole has to say about a lot of things but when it comes to certain subjects, it's seems he might try being a little more balanced about his knowledge intake The first ten chapters of the book, "Miracles" by C.S. Lewis is a good place to start (real down to earth rational stuff. It would be right up his alley). Anyway, thank you once again. I love the show and I'm a big fan. You guys rock. Keep on tackling that difficult questions. First, Iâ€™d like to thank you for playing my voicemail on the show. That actually took a lot of guts. Especially since I thought that if you did, you might get angry comments like Paul Darrowâ€™s and Etonâ€™s. Second, Iâ€™d like to thank Mike Stackpole (as well as Summer and Mike) for trying his best to answer a complicated question. My â€œanti-Christian/anti-Catholic inference radarâ€ tends to perk up whenever I hear anything said by anyone when related to any of these subjects. There is only so much of this kind of bigotry you can take before you have to stand up and call foul. This is not to say that you guys do it. Mike Stackpole may sometimes say something annoying and itâ€™s usually not really a big deal. I guess I was putting up with to much bias from other sources that week. Itâ€™s just that everyone seems to think that itâ€™s okay to say anti-Christian/anti-Catholic things because of the Crusades or the Inquisition (inspite of the fact that Secular humanism had the French revolution, and Atheism had Marxism). Third, Iâ€™d like to concur with what Eric Burns wrote on the third comment posted here. He wrote exactly what I was thinking. I love what Mike Stackpole has to say about a lot of things but when it comes to certain subjects, itâ€™s seems he might try being a little more balanced about his knowledge intake. The first ten chapters of the book, â€œMiraclesâ€ by C.S. Lewis is a good place to start (real down to earth rational stuff. It would be right up his alley). Anyway, thank you once again. I love the show and Iâ€™m a big fan. You guys rock. Keep on tackling the difficult questions.